There is a need for mental health services in schools. The Bureau of Labor Statistics projects that employment of clinical, counseling, and school psychologists is expected to increase by 14% from 2016 to 2026, a rate of growth that is roughly twice the average for all other occupations. In addition to the fulfillment that comes with helping a child learn, the job of a school or educational psychologist can be quite lucrative. The median salary for school psychologists in 2016 was $75,090, more than double the median pay for all other jobs. However, if you’re interested in becoming a school psychologist, you will likely need to first earn a doctoral degree. Take the first step toward a rewarding career by learning more about what an online educational psychology Ph.D. program offers. What Else Can I Expect from an Online Doctorate in Educational Psychology Program? What Are the Best Online Doctorate in Educational Psychology Programs? Online Doctorate in Educational Psychology Program Ranking Guidelines: We selected the degree programs based on the quality of program and range of courses provided, as well as school awards, rankings, and reputation. University of Georgia ranks among The Best Online Doctorate in Educational Psychology Programs! The University of Georgia’s online Ed.S. program provides an accelerated path to an advanced degree in educational psychology. Full-time students can complete the 31-credit program in about three years, allowing them to quickly transition to careers in higher education, classroom, and consulting settings. Distance learners can complete all of their courses online and asynchronously, although the program does require a field experience. The curriculum focuses on working with gifted and exceptionally creative young people. Students can choose from five concentrations: a social and emotional strand, a diversity strand, a creative strand, a foundations of educational psychology strand, and a research strand. In addition to a field experience, all students complete an applied learning project to cap off their studies. To apply, students must hold a bachelor’s degree earned with a cumulative GPA of 2.6 or higher. The University of Georgia is regionally accredited by the Southern Association of Colleges and Schools. University of Missouri - St. Louis ranks among The Best Online Doctorate in Educational Psychology Programs! The University of Missouri-St. Louis offers a research-intensive online Ph.D. in education with an emphasis in educational psychology. Students must earn a minimum of 90 credits, which includes coursework on quantitative and qualitative research methods, a nine-hour research internship, and writing and defending a dissertation. Distance learners also take classes on developmental psychology, cognition and learning, and character education. With the exception of the research internship, students can meet all of the requirements for this educational psychology Ph.D. online. UMSL delivers classes asynchronously, allowing students to complete coursework at their convenience. Distance learners can also choose between accelerated eight-week classes and more traditional 16-week classes. Students at UMSL can access web-based tutoring and an online mentor program. UMSL is regionally accredited by the Higher Learning Commission. 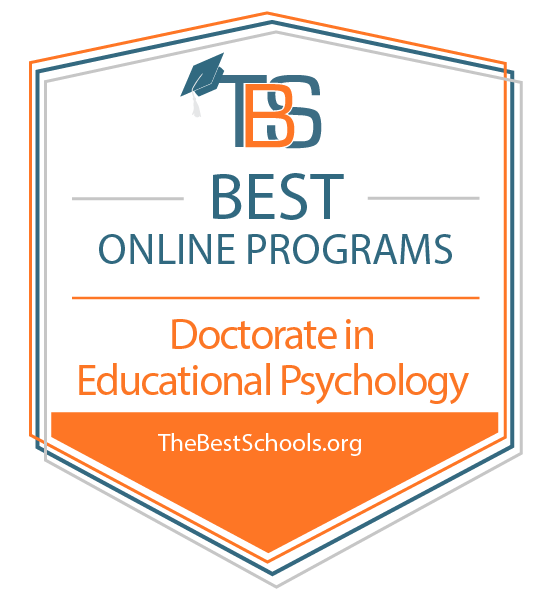 The Chicago School of Professional Psychology at Chicago ranks among The Best Online Doctorate in Educational Psychology Programs! Students interested in applying technology to the study of educational psychology can enroll in The Chicago School of Professional Psychology’s online Ed.D. program. Students pursuing this degree develop the knowledge and skills necessary to design, implement, and evaluate new learning technologies. While faculty deliver the majority of this program online in an asynchronous format, students must attend two 3.5-day residencies during the course of their studies. Students pursuing an Ed.D. in educational psychology online have the option of pursuing one of three concentrations: instructional design, higher education learning and technology, or K-12 learning and technology. All three options require students to earn 60 credits and write and defend a dissertation. Students must graduate within five years. Applicants should have a master’s degree in education or at least three years of professional experience in an educational setting. The Chicago School is regionally accredited by the Western Association of Schools and Colleges. Regent University ranks among The Best Online Doctorate in Educational Psychology Programs! Regent University offers an online Ed.D. in educational psychology that is taught from a Christian perspective. Students can complete most of the program online but must attend two four-day residencies at the university’s Virginia Beach campus. Full-time students typically earn their degree in 3–7 years. The program consists of 66 credits and begins with two courses that provide overviews of the school’s online learning system and Regent’s faith-based approach. Students then move and take classes within their area of concentration, exploring subjects such as culture and communities, the practice of leadership, and data-driven decision making. To graduate, all students must also complete and defend a dissertation featuring original research. Students applying to this doctoral program must hold a master’s degree in psychology or a related field. Veterans and active duty military personnel receive a 25% tuition discount. Regardless of which online educational psychology Ph.D. program you select, you will likely take similar courses, develop comparable professional skills, and be prepared for the same kinds of jobs. But many other details, such as tuition costs and the duration of the degree, will vary from program to program. Make sure to carefully research your options before deciding. Students explore developmental milestones that occur in the prenatal, childhood, adolescent, adult, and late-adult stages of life. They examine the impact of genetic and environmental factors on human development, as well as strategies and interventions used to promote and sustain healthy developmental processes. Educational psychologists must understand what forces drive students' behaviors in order to better support academic achievement and social and emotional development. This class provides a general overview of the diverse historical and contemporary theories behind human motivation, with a particular emphasis on children and adolescents. The best educational psychologists understand the full range of how student learning takes place. This class covers theories of learning, including constructivism, behaviorism, cognitivism, gestalt, information processing, and humanism. It also reviews theories of cognitive processes, such as language and memory. Educational psychologists often work with students who deviate significantly from the norm in behavior and achievement. This can mean counseling students with physical or learning disabilities, but it also involves supporting exceptionally gifted or talented students as well. The course emphasizes the importance of inclusion and diverse learning environments. To prepare students for the realities of their profession, many online Ph.D. in educational psychology programs feature coursework on ethics and professional standards. Students confront the ethical dilemmas that often arise in academia, individual counseling, and through working within diverse communities. This course also introduces students to ethical questions they may face if a client becomes involved in the legal system. How Long Does It Take to Get an Online Doctorate in Educational Psychology? Earning a Ph.D. in educational psychology online usually takes between three and seven years, but this can vary depending on a few factors. The first stage in earning your doctoral degree is completing required coursework. Students often take these classes as part of a cohort, meaning they learn alongside their peers as they progress through the program together. However, some programs may be self-paced, allowing students to proceed at their own speed. Most full-time students finish their coursework in two to three years. The second stage of earning a degree is completing a dissertation. Generally speaking, students work with a faculty adviser on their dissertation, but they do the majority of their research and writing independently and at their own pace. When finished, students defend their dissertation in front of a faculty committee. Most full-time students complete the dissertation process in one to four years. When choosing among online educational psychology Ph.D. programs, make sure to find one that is accredited. Accreditation ensures that a program meets acceptable educational standards and sufficiently prepares graduates for the profession. Employers may not recognize degrees earned at unaccredited institutions. There are three types of accreditation: regional, national, and field-specific. Seven independent agencies handle regional accreditation for the majority of nonprofit schools in the U.S. Regional accreditation is the oldest, most common, and generally most respected form of accreditation. The U.S. Department of Education (ED) authorizes ten additional bodies, such as the Council on Occupational Education and the Distance Education Accrediting Commission, to administer national accreditation. Nationally accredited schools are usually for-profit institutions. Finally, schools or programs may be accredited by a field-specific agency authorized by the Council for Higher Education Accreditation (CHEA). For example, the CHEA has authorized the American Psychological Association Commission on Accreditation to accredit programs that award doctoral degrees in clinical, counseling, and school psychology. Before beginning a Ph.D. in educational psychology online, make sure your program has been accredited by a regional, national, or CHEA-authorized accreditation agency. You can view a list of authorized accreditors on the ED website or the CHEA website. After earning an educational psychology Ph.D. online, graduates can work in a variety of settings. Many will find jobs at a school, district, or other educational organization. Some may work at a government agency to help shape education policy. Others may prefer counseling students and families in private practice. No matter what their career path, educational psychologists need strong analytical, observational, interpersonal, and communication skills. School psychologists use their understanding of human behavior to support student learning. They may help students address emotional problems, design and implement plans to boost a student’s academic performance, or collaborate with teachers and administrators to develop broader teaching and learning strategies. Most school psychologists hold a doctoral degree, like an online educational psychology Ph.D.
Postsecondary teachers instruct and advise students at trade schools, colleges, and universities. They also conduct psychological research or write about topics in educational psychology. While a master’s degree may be sufficient for jobs at community colleges, most of these jobs require a doctoral degree in one’s field of study. School counselors support the academic and social-emotional development of their students. They evaluate a student’s abilities or aptitude through various assessments; work to address issues that affect school performance; and help administrators create programs and policies meant to curb bullying, drug use, or other problems. School counselors usually hold an advanced degree. After earning an educational psychology Ph.D. online, some graduates may work exclusively with students who struggle with behavioral or mental health issues. These professionals often collaborate with schools and educational organizations, but may themselves work at treatment centers or in private practice. These positions typically require an advanced degree. Rather than working with individual students, instructional coordinators design, implement, and assess school curricula and teaching standards. Instructional coordinators often must have an advanced degree, and online educational psychology Ph.D. programs can help students develop the kind of skills and knowledge necessary to create strong learning experiences for students. Educational psychologists, no matter what career path they choose, can look to professional organizations for a number of different benefits and resources. Many organizations provide opportunities to network with peers at local chapter events or national conferences. Some may also offer educational or professional development resources to their members. They also host job boards or career centers to help those looking to enter or advance within the field. Three professional organizations for educational psychologists are detailed below. The APA is the leading scientific and professional organization for psychologists of all backgrounds. Two divisions within the organization provide resources specifically tailored for educational and school psychologists respectively. The ASCA works on behalf of school counseling professionals around the world. It offers a wealth of online professional development opportunities, a web-based networking platform, and a magazine featuring the latest news from research and the field. The NASP advances practices that improve students' learning, behavior, and mental health. In addition to its expansive collection of research, practitioner guides, and policy briefs, the NASP administers a national certification exam for school psychologists. The first step toward earning your educational psychology Ph.D. online is completing the Free Application for Federal Student Aid (FAFSA). The FAFSA connects eligible students with various kinds of financial support, including grants, loans, and work-study opportunities. Students do not need to pay back federal grants or work-study wages, but they do need to repay loans. However, federal loans feature relatively low interest rates, and the federal government may also forgive all or a portion of a loan if a student works in public service for a set period of time. Many states and private organizations offer scholarships to students based on academic achievement, community service, or financial need. Teachers looking to transition to a career as an educational psychologist may also qualify for discounted tuition or tuition reimbursement, depending on the program and their employer. Finally, students can apply for private student loans. While these loans can be helpful in financing a part of the total cost of education, students should exercise caution in taking out private loans to cover the majority of their tuition and other expenses. Private loans typically have higher interest rates than federal loans, and private loan organizations usually do not forgive loans for public service.